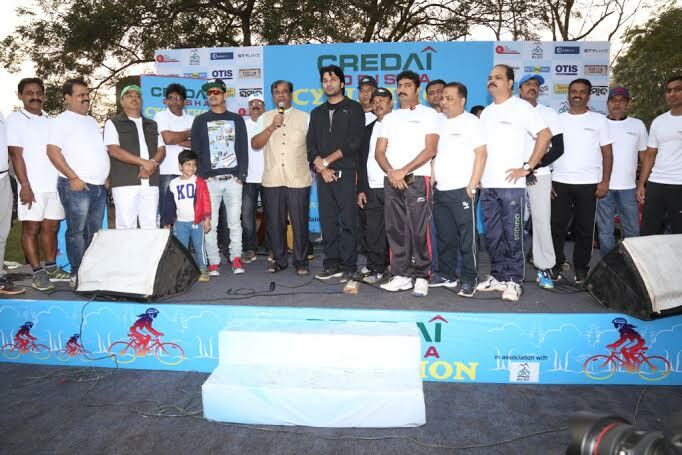 The Odisha Chapter of Confederation of Real Estate Developers Association of India (CREDAI) today has organized a mass cycling programme – “CREDAI Odisha Cyclothon” with an aim to promote eco-friendly transportation. Attending the start venue at Neheru Club Ground as Chief Guest Hon’ble Minister, Tourism & Cultural Dept (GoO), Ashok Panda flagged off the Cyclothon where Berhampur MP, Siddhanta Mahapatra and Korei MLA & Brand Ambassador of CREDAI Property Expo 2016, Akash Dasnayak were also present as Guests of Honor. Started with a musical rock band performance by Dhwani followed by encouraging speeches from Hon’ble guests and youth icons the Cyclothon covered the route map through Capital Hospital square, Shisu Bhavan square, Rajmahal square, Master Canteen square, Ram Mandir square and returned to the ground. Around 250 enthusiastic cyipated in the programme aimed not only at promoting eco-friendly transportation, but also at spreading a strong message of health consciousness among the people of capital city. Encouraging the organizers during his address to crowd, the Tourism & Cultural Minister, Ashok Panda said, “I am very proud to be a part of this great programme. Though these programmes are not going to solve the purpose of eco-friendliness in just a day, but they have very positive impact on the society in terms of spreading awareness.” “I welcome CREDAI team and all associates on organizing such a novel activity in the city,” he added. Among others Mr. Dilip Patra, President CREDAI, Mr. Binaya Krishna Das, Immediate Past President CREDAI, Mr. Sangram Kesari Sahoo, General Sec CREDAI, Mr. Swadesh Kumar Routray, Vice President CREDAI were also present at the programme. In the end the participants were felicitated with certificate of participation from CREDAI Odisha. It should be noted that CREDAI Odisha, the Odisha Chapter of Confederation of Real Estate Developers Association of India (CREDAI), is going to organize its annual property expo from 21st Jan’16 to 24th Jan’ 16 here at Bhubaneswar.